With each new exciting release of an operating system from Microsoft, there comes the sudden realization by every IT pro that you are going to need to perform the migration to this new platform. This is usually followed by several other realizations about how "this program" probably won't be compatible and "that user" is going to need their specific settings to migrate, etc. So while the end result (a new secure and more productive OS) looks fantastic, getting there is obviously going to be a challenge. Since you are reading this whitepaper, I can only assume you a) are planning a pending migration to Windows 7 and b) you've come to the previously mentioned realizations. 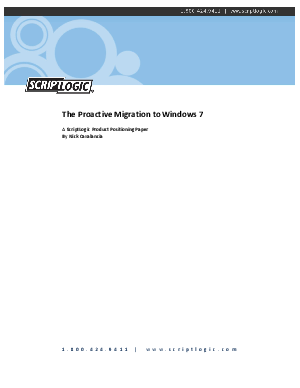 In this whitepaper, I'd like to discuss a very different migration strategy to moving your users and their desktops (a term I'm using generically throughout this paper to mean any PC regardless of its physical configuration - laptop or otherwise) to Windows 7; one that takes a very proactive approach that will result in a faster migration, a more standardized environment, and more productive users.